Pankaj shaikshanik & samajik sans tha chopda, Jalgaon has advertised in THE Lokmat newspaper for recruitment of PGT/PRT/TGT jobs vacancies. 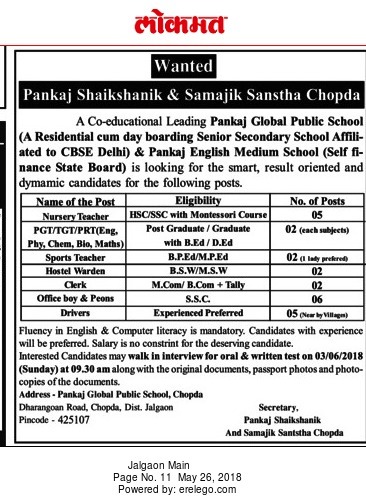 Interested and eligible job aspirants are requested to attend interview on 03rd June 2018 .Check out further more details below. Name of the School: Pankaj shaikshanik & samajik sans tha chopda, Jalgaon. 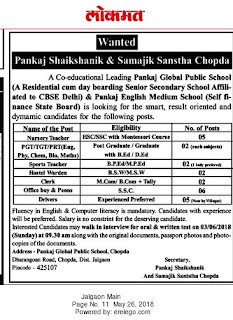 Preference will be given to the candidate who are educated from English medium school. How to Apply: Interested and eligible candidates may walkin interview for oral & written test on 03/06/2018 at 9.30 a.m along with original documents, passport photos, and photocopies of documents. Pankaj shaikshanik & samajik sans tha chopda, Jalgaon.